In a familiar premise, Turbo (Ryan Reynolds) wants more out of life than what his biological limitations or station in life will allow. His is the same spirit that made man want to fly—only this fellow would probably settle for a good crisp walking pace. 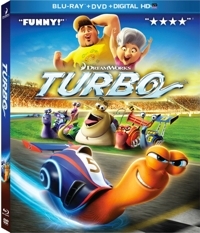 Turbo is a snail that happens to be a huge racing fan, especially of the Indy 500 and perennial winner Guy Gagné (Bill Hader). The arrogant Gagné mugs for cameras and says all the right things to stay in the spotlight, including the kind of inspirational dream-big quotes that fill Turbo’s head with fantastic ideas that he can somehow become faster than he is. That kind of thinking can you killed, and it takes his brother (Paul Giamatti) to save him from the blades of a lawn mower when a test “sprint” puts him in danger. So how do you have a story about a snail who dreams of speed turn into something other than a downer? Of course you have a Spider-Man type of transformation, where nitrous oxide (yep, laughing gas) somehow boosts Turbo’s power the way, in liquid form, it sometimes increases the power of racing engines. Entire family: Yes, if . 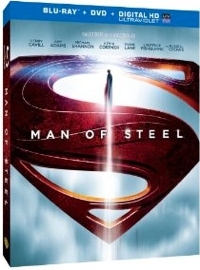 . .
Man of Steel is the kind of sci-fi action film you’d expect if you thought for a moment about the fact that Superman comes from another planet. Played by Henry Cavill, he seems much more alien and more psychologically tormented than any Superman we’ve seen on the big or small screens thus far. Instead of x-ray vision he has eyes that glow red and can sear things. And instead of feeling the warm fuzzy bond with his parents that we’ve seen in previous incarnations, he’s the adopted child who, though he loves the man (Kevin Costner) and woman (Diane Lane) who raised him, still seeks his real parents. Flying, stopping bullets, or lifting vehicles used to be all in a day’s work for Superman, but this outing—a revisionist reboot from director Zack Snyder (300, Watchmen)—the action is ramped up in 21st-century fashion. Adding to the mayhem is a fractured narrative that jumps around in time. It’s all very figure me out, with a pace and style that’s geared toward younger viewers who grew up with blockbuster special effects and seem to crave, always, more. Which is to say, how you respond to Man of Steel may well depend upon your age.